Originally published in February of 2017, this post keeps ending back in my drafts folder with no explanation. I have published it twice before but it seems to get returned to drafts after a few days. Nothing here should interfere with copyright laws, I can find nothing offensive in the post, and I employ my own photos. This is basically a book review of several publications. If it gets flagged by someone, I would greatly appreciate a note of explanation. If you know me, then you know I get “little kid surprised” when I get something special in the mail, even if I ordered it and was expecting it. Sometimes I think that I order online so I can open a new package– like every mail delivery day is my birthday. Thursday was no different. I received a bunch of art supplies in the mail–Sakura pens and pen brushes, tons of practice tiles, Chai Latte, and a book! I thought the pens would top my excitement meter. It turned out that it was the book that sent the excitement rating off the chart. The book is Yoga for your Brain, by Sandy Steen Bartholomew. Published in 2011, it is an “older” Zentangle how-to book, but it’s ideas are fresh to a novice tangler like me, and the author Re-defines Zentangle in a fresh and awakening manner. It looks like a book I will turn to over and over for years to come. What makes it exciting? This isn’t just any old how to tangle book. Ms. Bartholomew shows you how to see like an artist and tangler. New patterns are all around us if we just take a moment to see them. Sure, we look at stuff all the time. But are we seeing potential patterns to tangle? The author demonstrates how she came up with tangle patterns during a “whirlwind tour.” And she shares her secrets with the rest of us–all while providing lots of instruction and helpful tips on aspects of tangling. This book is not the author’s first book on tangling. It’s the sequel to Totally Tangled, my copy of which should reach me from Amazon by the end of next week (I live in the Caribbean and we get our mail through a mail service once or twice a week). If you are completely new to Zentangle® and the Zentangle Method®, your most cost-effective book is the Zentangle Primer, by Zentangle founders Rick Roberts and Maria Thomas. At almost $50, it’s a little costly, but I learned about its value after spending three times it’s price on other books (see my post, “Growing Into Tangling,” here). The Primer is available on the official Zentangle web site. I don’t know yet if Totally Tangled is the next best book for the beginning tangler. I continue to recommend Beckah Krahula’s book, One Zentangle a Day, available online from Amazon, as the second-best “first” Zentangle book. 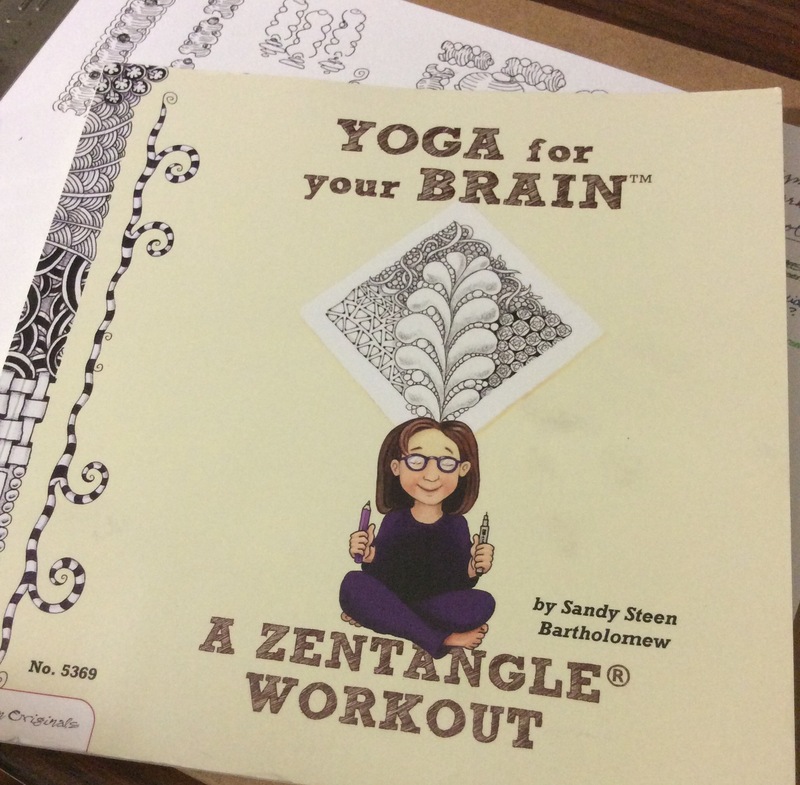 Since Yoga for your Brain book was published, Sandy Steen Bartholomew has had other Zentangle publications. She has a writing style that tells you what you need to know in very concise language that gets right to her point (and your pen point) quickly. Tons of illustrations–from step-outs to project ideas–make it almost picture-book simple to understand and follow along, yet it is packed with information on tangling techniques, creating your own tangles, and projects that are both crafty and artistic. These make the book as useful to professional artists looking to add Zentangle art to their work as to all the talented crafters and newbie tanglers out there. It is under $13 on Amazon, so it’s an investment that won’t break your budget. But the small price hides a wealth of ideas and tips, making the investment a great opportunity, especially for your artistic growth. I have this book on my wishlist. But wondering if I should go for it since I already have One Zentangle a Day by Beckah Krahula. And I am not sure if the books are similar. Do you recommend I go for this book? Every book is different, and each has unique advantages and patterns. Sandy Steen Bartholomew does a great job of showing how to see patterns in things and places around us, while Beckah Krahula gives a wonderful overview of the basics and creativity of the Zentangle Method. If you are a serious tangler, the best investment you will ever make is the official The Zentangle Primer, Vol. 1, by Zentangle founders Maria Thomas and Rick Roberts. You will never outgrow The Primer. It is available directly from Zentangle.com , or from most CZTs (Certfied Zentangle Teachers). Local CZTs can be found at Zentangle.com if you are not attending workshop sessions. I realize that sounds like I didn’t answer your question, but I haven’t found a book on tangling yet that does not contain unique information or methods. Bartholomew’ books are inexpensive enough that they can affordable be added to a personal tangling library. Go for it! I’ll add it to my wish list! I ‘m just glad this post wasn’t remanded back to my drafts folder yet. Maybe the note at the top helped, or maybe third time’s the charm! Thanks for commenting, Cyndee! You always add so much to my blog!